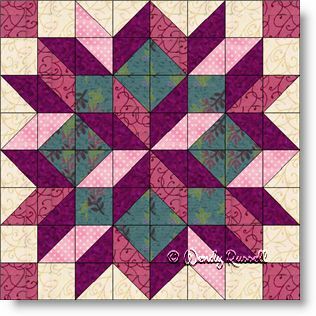 The Carpenter's Wheel quilt block has been around for a long time and is also known by a few other names ... Star of Bethlehem and Carpenter's Star. Most of the time, this block is made using squares and diamonds, but I have chosen to make this pattern using half square triangle sets, rather than the diamonds, to avoid distortion of the bias edges from the frequent handling, and also this method avoids the dreaded set in seam. My view is why do it the hard way and when you can choose the easy way? Now the down side of using the half square triangles is that there are more pieces to sew together. However, the ease of making the block far outweighs the numbers, (in my humble opinion). Also, due to the number of pieces in the block I have labeled it as an intermediate level of difficulty ... for that reason only. The good news is that you can make a big block, so less blocks to sew. I couldn't stop playing with the colour combinations in this block, as it is one of my all time favourites. So, I have given cutting instructions for the 5 colour version, which you can easily adapt to less colours if you choose. I also added extra pages to the pattern with more samples. I hope you enjoy this block as much as I did playing with it!